Posted by OeWF in AMADEE-18, Press Releases. Today representatives of the Sultanate of Oman and the Austrian Space Forum (OeWF) signed their agreement to conduct the OeWF’s next Mars-Analog-Mission in the desert of Oman. 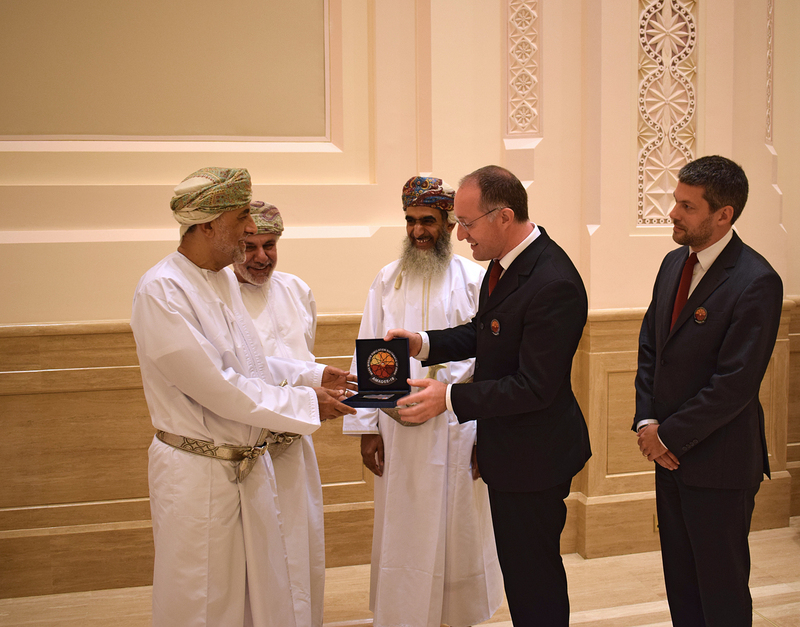 His Excellency the Austrian Ambassador to the Kingdom of Saudi Arabia, Sultanate of Oman and Republic of Yemen, Gregor W. Kössler as well as 200 guests attended the ceremony in Mascat, Oman. Today Dr. Gernot Grömer and Mag. 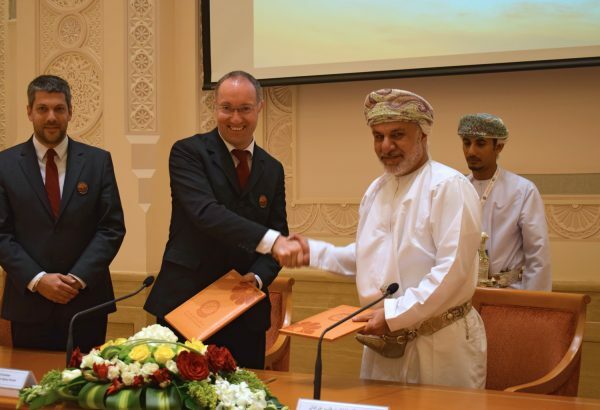 Alexander Soucek, Board Members of the Austrian Space Forum and His Excellency Prof. Al Khattab Al Hinai, Chairperson of the National Steering Commitee and Oman Astronomical Society aswell as Dr. Saleh Al-Shidhani, President of the National Steering Commitee and Oman Astronomical Society signed their agreement to conduct the Austrian Space Forum’s 12. Mars-Analog Mission AMADEE-18 in the desert of Oman. Signing Ceremony of the Memorandum of Understanding (from left): Mag. Alexander Soucek, Vice President of the Austrian Space Forum, Dr. Gernot Groemer, President of the Austrian Space Forum, His Excellency Prof. Dr. Khattab Al Hinai, Vice President of the Oman State Council and chairman of the AMADEE-18 Oman National Steering Committee and Osama Al Busaidi, Project Manager, AMADEE-18 Oman National Steering Committee. Also today the AMADEE-18 Mission Patch was presented. 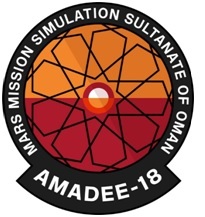 The AMADEE-18 mission is organized by the Austrian Space Forum in partnership with institutions from more than 20 nations. The Patch symbolizes a typical Arabic ornamental pattern. The nodal points of the black lines stand for the multidisciplinarity of the experiments, whilst the orange hues are a symbol of a desert sunset. Under the motto “Two worlds. One sun.”, the AMADEE-18 mission patch also stands for the sun as a common feature explorers will see on both Earth and Mars. “Through testing equipment, software, procedures and workflows that will be implemented in future human missions to Mars we try to find out what is not yet working, what needs to be redesigned, rethought. After all, it’s better to find the flaw in Mars-equipment here on Earth rather than on Mars where spare parts are a 6-months-journey away at best.” The Austrian Space Forum’s missions draw considerable media and social media attention across the globe. More than one million people followed the last mission and got a closer look at the cutting edge of research in Austria. The Austrian Space Forum (Österreichisches Weltraum Forum, OeWF) is a national network for aerospace engineers, scientists and people with a passion for space. This citizen-science organization is involved in leading-edge space exploration research and serves as a communication platform between the space sector and the public; it is embedded in a global network of specialists from the space industry, research and policy.